Cycle Campaign Workshop. 29th July, 1 day to go! We have a few more interesting project ideas ranging from engaging local communities, French traffic lights rules and how to investigate road accidents. Come to the workshop to find out more! Lunch and tea breaks are provided, but a £5 donation will help cover costs. Between 10:30 and 11:00am we will have someone outside letting attendees on bicycles through the barriers at the road entrance of City Park, and round the back of the building to the underground carpark. There are bike racks and another helpful person will direct you upstairs to the registration desk on the ground floor. If you are coming by car or by foot, car parking is next to the building at the front and you will find the registration desk straight on through the main door entrance on the ground floor. We will direct you to the workshop from there. Cycle Campaign Workshop. 29th July, 2 days to go! 2 days to go, nearly there! #GlasgowCycleInfraDay2: A short concentrated twitter campaign to highlight the good and bad examples of cycling infrastructure in Glasgow. #GlasgowCycleInfraDay last ran in 2015 and we hope to repeat it’s success for the new GCC administration. Looking for people to help with scope, time, promotion, collation methods and of course participation. Quick, Simple and Cheap: Get people cycling in Glasgow city centre by giving them ad hoc infrastructure to try-out. Real world, quick response cycle infrastructure built with simple, cheap segregation would soon show what the real demand was, highlight problems and justify a permanent solution; or could be easily be removed. This could dramatically speed up the present long winded process for establishing cycleways. Cycle Campaign Workshop. 29th July, 3 days to go! 3 days to go! Don’t forget to book! Cycle Desire Network map: Using local knowledge and cycling data we can highlight the missing gaps and most important direct routes that need to be made safe for all. Using QGIS mapping software people can help contribute to a configurable digital map which can be shown to councillors and decision makers; this has been well revived in other cities. Having a laptop will be useful for using the open source software. Friends of South City Way: With a new protected bike path from Queens Park to the city centre, we anticipate a bike lash. By setting-up Friends of South City Way the hope is to minimise misinformation and increase local support. Looking for people to be involved in setting-up a website, social media, organising local events and of course joining our campaign! Cycle Campaign Workshop. 29th July, 4 days to go! We have some interesting 10 minute talks about what local campaigners have done recently in the Glasgow area. Using cycling data. Bob Downie. Some of the talks have a direct relevance to some proposed pitches, more about that soon! Do sign up if you haven’t already. Cycle Campaign Workshop 29th July, 5 days to go! With 5 days to go before the Call to Action cycle campaign workshop this Saturday, we encourage every one to sign up! We also have some short talks about what GoBike has been doing recently, more on them soon! If you have an idea you’ve not yet submitted, please do put it here. * Donation to cover costs, do sign up; we’ll have a better estimate for feeding lots of hungry people! Aimed at people in the Greater Glasgow area who are looking to push things forward for cycling in the city and beyond, GoBike are delighted to invite you to our inaugural campaigning workshop event. Showcasing GoBike’s recent campaigning activity and successes, the day will provide attendees the opportunity to meet, discuss and collaborate with other like-minded members and volunteers in formulating ideas and target areas you think our campaign needs to focus on. Do you have an idea burning at the back of your brain you would like to pitch at the workshop? Please tell us your idea and a short description and we can fit it into the agenda for the day! 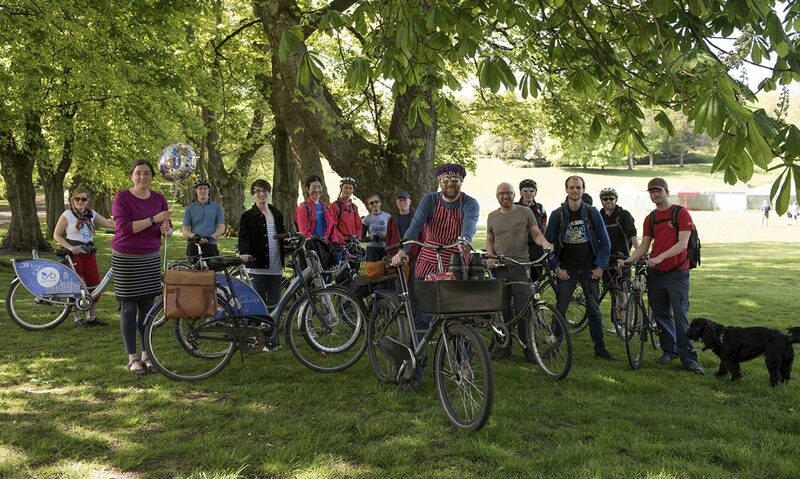 If you have a passion for helping make Glasgow and surrounds a healthier, happier and more pleasant place to get about, our workshop is the essential cycling date of the summer. Book your place now – tickets to this exciting campaigning event are free but limited. Any questions or discussions can be had in the Glasgow City Cycling Forum.